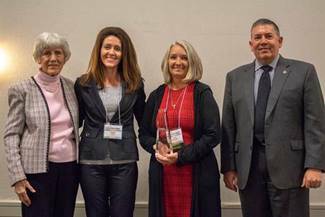 ST GEORGE — Switchpoint Community Resource Center received the Innovator of the Year award at the 15th Annual Homelessness Summit held in Salt Lake City on Oct. 25. Each year, the Utah Department of Workforce Services, Housing and Community Development Division recognizes individuals and organizations for their efforts in serving people who are experiencing homelessness. Those recognized have demonstrated going beyond standard practices to help people make a positive change in their lives. Switchpoint Homeless Shelter and Community Resource Center was chosen for providing more than just emergency beds and meals for people. For more information about Switchpoint and to learn ways you can help, click here or call Morgan Barrick at 435-628-9310 ext. 103. Homelessness in St. George: How big of a problem is it?